Recruited from St Marks in outer-suburban Fawkner (he also played for Fawkner), Dunlop was a bullocking 196cm ruckman who played 21 games for the Blues in the late 1980s, starting in 1987. His game time was limited as Justin Madden was slowly developing into one of Carlton's all time great ruckmen, and others like Peter Sartori and Mick Gallagher were reasonable backups. He was aggressive but never really took advantage of his strength, and was a victim of the list purge in the early 90s. He was reported in his first game against West Coast Eagles for striking Laurie Keene, he was given a reprimand. 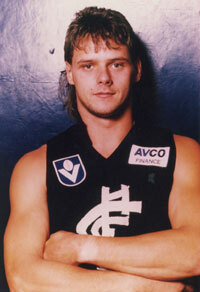 His older brother Daryl Dunlop had also played for the Blues U/19's and Reserve teams. He was known for a particular party trick of being able to eat a McDonalds "Quarter Pounder" and "Cheesburger" together in one bite. Dunlop wore No.54 and No. 40 in 1984, No. 42 in 1985, and No.52 in 1986 whilst playing with the Blues reserves. Contributors to this page: Bombasheldon , molsey , WillowBlue , pblue , AGRO , p(12)terg , true_blue24 , Jarusa , PatsFitztrick and admin . Page last modified on Sunday 28 of April, 2013 06:57:26 AEST by Bombasheldon.